St. Paul de Vence tour with Villa Ephrussi de Rothschild Includes: Private transportation and English speaking tour guide, taxes, tolls and parking. Departure points: Nice, Monaco, Antibes and surrounding area. Other departure points available. Inquire. This lovely private St. Paul de Vence tour starts with a drive through the French Riviera. Your first stop on this guided tour will be the village of St. Paul de Vence, just a few miles from Nice, where you will enjoy exploring its ancient cobblestone lanes, fortified walls and art galleries. The picture-perfect views and plays on light here make it clear why so many impressionist painters came here for inspiration. Suggested restaurant for lunch is the famous La Colombe D’Or. 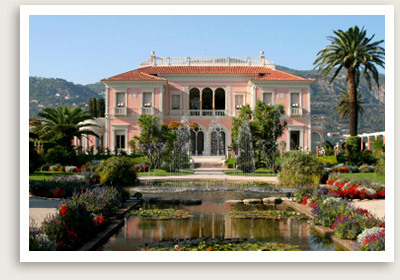 Next you will be treated to a fantastic tour of one of the most beautiful villa on Cote D’Azur. Built to on the narrowest part of Saint-Jean-Cap-Ferrat peninsula, Villa Ephrussi de Rothchild’s garden is site not to be missed.